Small bowel aspiration for quantitative and qualitative culture specimens is still regarded as the gold standard for diagnosis of SBBO. The sample should be properly harvested with respect to sterile technique and accurate location. The exact composition of the microbiota is not important for the diagnosis of SBBO if one uses the definition that more than 105 colony forming units/ml small intestinal fluid represents SBBO, but it is of use when antibiotic therapy is being considered. It should be realized that cultures of randomly harvested samples can produce false-negative results if the sample is not taken from the actual site of bacterial overgrowth. thus one does not have to obtain the aspirate from the exact same location in the proximal jejunum (51). Aspirate can be acquired by intestinal intubation with sterile or nonsterile tubes, the capsule method, direct needle aspiration of the gut contents, peroral intubation, and by the string test as described below. This endoscopic method for collection of proximal gastrointestinal fluid for culture is simple and can be performed during routine endoscopy. When the endoscope reaches the descending part of the duodenum, the polyethylene tube will pass through the biopsy channel into the intestinal lumen. Intestinal intubation seems to be the most suitable and reliable method for studying small intestinal microbiota, because of the short sample collection time and minimal disturbance of physiological conditions. Care must be taken to prevent contamination with upper respiratory tract microbiota during the passage of the tube, and to maintain oxygen-free conditions for anaerobic culturing. A closed polyethylene tube filled with water through the suction channel of the endoscope is therefore recommended, as it is not necessary to keep the suction channel sterile. The water has to have been boiled for sterilization and the removal of dissolved oxygen. The distal end is closed with a plug of agar. Because the innertube remains sterile even after the passage through the nonsterile suction channel of the endoscope, the use of an overtube eliminates the possibility of contamination. The proximal end can be attached to a double way stopcock connected to a syringe containing boiled water. In the duodenum the agar plug can be expelled from the tube by injection of the water in the syringe. After several minutes the expelled water has gone through and the duodenal contents can be aspirated into the tube, after which the tube is removed from the endoscope. Precision of the sample site and proven absence of contamination are the main advantages. Since fresh aspirate is known to tolerate oxygen fairly well for an exposure time of at least 8 hours, it is a good method for obtaining aerobic and anaerobic samples (60,62,67). Highly significant correlations (rs = 0.84, p< 0.001) were found between the numbers of bacteria/ml of jejunal aspirate obtained from the closed and open tubes, confirming that the intubation method is highly reproducible (51). The use of suction during endoscopy contaminates the suction channel of the endoscope. The first milliliter of aspirate can be discarded to avoid this, although this is very difficult in the duodenum, where at best only a few milliliters of aspirate will be found (67). Using an open tube for collection of small bowel fluid can theoretically lead to contamination, but according to reported studies this does not seem to be the case (68,69). The duodenal string test capsule is a cheap and simple device used for sampling the contents of the upper gastrointestinal tract. It has been used for the diagnosis of typhoid fever, whereby sampling duodenal contents by a "string" test yields a positive culture in 70% of patients (70). The weighted gelatin capsule contains a silicone rubber bag and a 140 cm highly absorbent nylon string. After a 10-hour fast the device is administered. The first 10 cm of the nylon line is pulled out from the capsule by the protruding loop. The capsule is then swallowed with water while the loop is held outside the mouth. The loop is then taped to the face to secure the line. After approximately 3.5 hours the thread has moved into the duodenum. The volume of the duodenal fluid absorbed by the distal end of the thread is calculated by subtracting the dry weight of the segment. The distal end is squeezed out between sterile gloved fingers in order to collect the intestinal contents. Its major applications in pediatrics are the diagnosis of enteric parasitic infestations, and the diagnosis of Salmonella infection, Giardia lamblia, and assessment of duodenal bile salts in the diagnosis of neonatal cholestasis in duodenal contents. A drawback of the Enterotest is that when the string is pulled out of the gastrointestinal tract, the intestinal contents adhering to it are exposed first to the sterilizing effect of gastric acid, and afterwards to contamination with microbiota present in the esophagus and pharynx. The Enterotest is not useful for the isolation of anaerobes because samples cannot be protected from contact with air. The clinical value of the string test compared with a sterile endoscopic method for sampling small bowel secretions is limited by poor sensitivity, specificity, and positive predictive value. Thus the string test is not an adequate substitute for oro-duodenal intubation for the detection of SBBO (60,71). Peroral intubation and aspiration of luminal contents can be achieved using Miller-Abbott or Levin tubes. These tubes were modified to suit the special needs for culture studies. The headpiece of a Miller-Abbott tube comprises a capsule, which may be opened and closed by hydraulic pressure. The capsule has an advantage of large size (44.5 X 12 mm), but it has been proven possible for bacteria to gain access into the closed capsule in vitro. A Levin tube is clinically used as a gastroduodenal feeding tube with a length of 125 centimeters. A long radio-opaque tube is used, marked for accurate placement, either single- or double-lumened, with or without balloons, and perforated by one or more holes at its distal end. These perforations were either left free or were protected by means of a collodion membrane, a thin rubber sheath, or by plugs, which could be either dissolved or dispelled by positive pressure at the moment of taking samples for culture. Contamination of the tubes depends on the degree of contamination of the surrounding fluid, the exposure time, and the static environment. 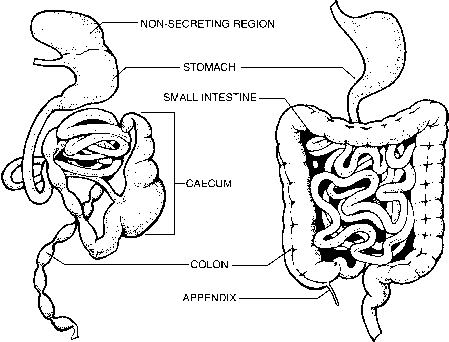 The small intestine contains only a very small quantity of fluid in contrast to gastric juice, which may be aspirated in large quantities. A disadvantage of peroral intubation is the lack of certainty that the specimen obtained from the desired level of the intestine has not been contaminated by bacteria from a higher position during its passage.